Vines can provide a show stopping visual feast or be used as a cloak of invisibility, depending on the intended outcome. 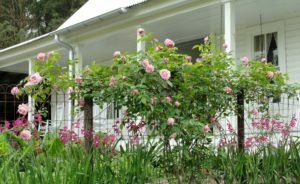 The drawback for most gardeners when it comes to growing vines is space and something for them to grow on such as a fence, trellis, arbor, or pergola. But before knowing how much space one needs or what to grow them on, it’s imperative to know which vine you’ll be using. After all, there are diminutive vines like Clematis texensis and there are sprawlwart behemoths like the Lady Banks rose. Knowing how they climb is equally important, as each vine evolved with a mode of ascent. Vines can be divided up into those that: 1. Twine (like wisteria, Carolina jessamine, and honeysuckle); 2. Have clinging tendrils (like sweet peas, grapes, and passion vine); 3. Have suction cups (like Virginia creeper and Boston ivy); 4. 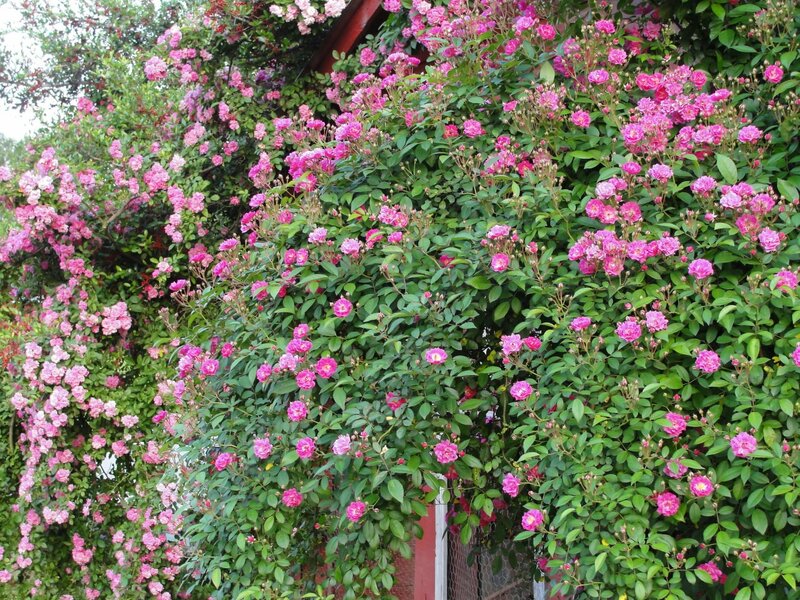 Have aerial rootlets (like trumpet creeper, climbing hydrangea, and English ivy); or 5. That just plain sprawl (like Lady Banks rose). So as you can see, some vines need training, some need support, and some are fine with brick walls and tree trunks. 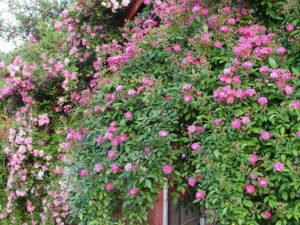 Ever since my early days as a Texas rose rustler (see The Rose Rustlers, 2017, Texas A&M Press) I’ve loved growing climbing roses. These however present three main challenges. First of all, roses don’t have any method of climbing which means they have to be trained, tied, wired, harnessed, roped, etc. Second, they tend to be large and need space. And third, many of them are thorny when means a bloodletting in the process. After naively volunteering to move both a huge flesh eating Mermaid rose and an equally huge and equally flesh eating Cherokee rose while at LSU, I’ve pretty much been growing thornless ramblers from that point on. For most of my gardening life, I’ve also been dealing with a chest high double loop wire fence for displaying vines. I say “display” as that had always been my primary focus. I’ve either used the vines to show off themselves, or to frame the view of my ancestral old farmhouse. 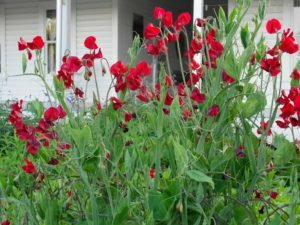 At different times throughout the last twenty years I’ve grown hyacinth bean, sweet pea, native clematis, perennial morning glory, coral vine, Pam’s Pink honeysuckle, and climbing Belinda’s Dream rose on my front fence. 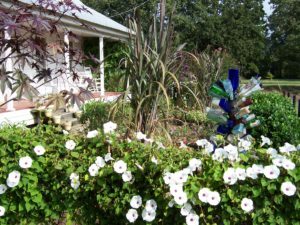 But then I decided that I would rather the focal point be my old home at the end of my crapemyrtle allée instead of the fence and vines. This also gave me more light and air circulation for my “cottage garden” perennial border out front. Since my house faces east and blocks the afternoon sun, I actually need as much light as possible. It only took 20 years to come to this design conclusion, one that I was completely comfortable with…that is until the day I was struck by a bolt of Cajun lightning. Whereas Mr. Extrovert likes sunlight beaming in on a swept yard cottage garden, vegetables amid bare dirt rows, and a dust covered stark white porch; Mrs. Introvert likes coifed turfgrass, large shade trees, and as many privacy hedges and vines blocking the view as possible. So then it began. First I planted ten mail ordered Lonicera sempervirens ‘John Clayton,’ a yellow flowered cultivar of our native coral honeysuckle. 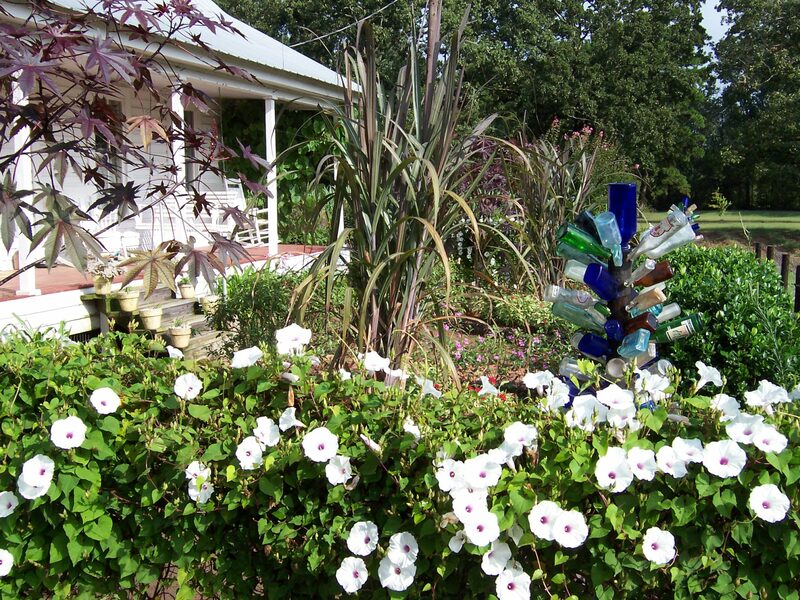 This would give me a hummingbird plant in a complimentary color to my heirloom purple crapemyrtles lining the drive. 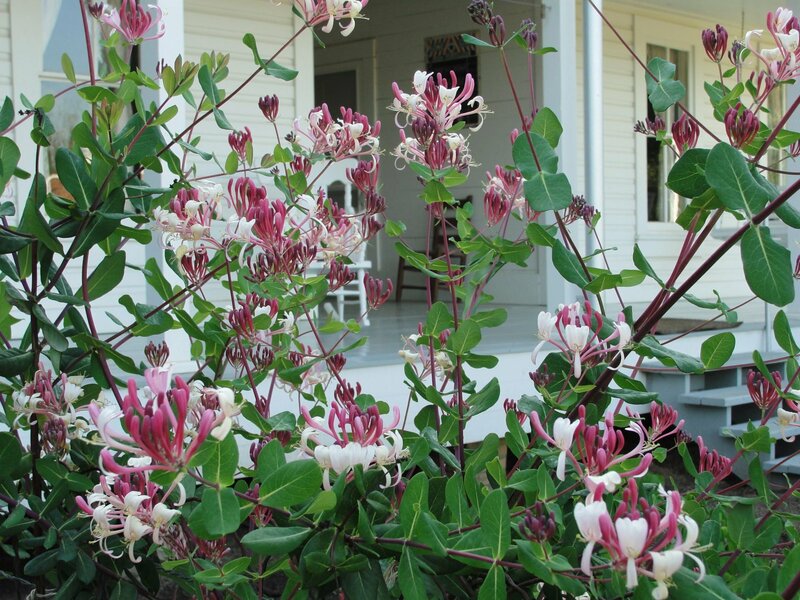 Unfortunately some of the honeysuckles died in last summer’s drought and they weren’t going to be dense enough to hide Mrs. G. They weren’t cheap, but I pulled them out. Next I planted Confederate jasmine (Trachelospermum jasminoides), including both the standard type and ‘Madison’ which is purportedly more cold hardy. Mrs. G had Confederate jasmine at her balmy South Louisiana abode so was familiar with it. Unfortunately, neither jasmine nor Mrs. G was familiar with what she now refers to as “the Arctic tundra.” So naturally, sparsely foliaged, brown vines weren’t going to hide the Cajun Queen. I tried to tell her that the brown leaves would match the brown dirt if she’d just let me go back to my historic, bare dirt, swept yard…to no avail. Why didn’t I think of “yellow jasmine” to begin with? I’m sure I did, but assumed the heady fragrance and pollinating bees (both of which I love) would cross them off the list (and probably will one day). So yesterday I stopped at little King’s Nursery in Tenaha on the way back from the District 4H Roundup Horticulture ID contest in Carthage and picked up 10 one gallon Carolina jessamines. Today between writing this blog and my weekly newspaper column I’ll untangle dead Confederate jasmines from the fence and plant the yellow jasmines. They don’t look like much right now but I know they will one day…if they get to stay. I should probably just plant the pots in the ground to make them easier to dig up.